I got the inspiration for these cupcakes from a Pinterest post that had no recipe link, so decided it wouldn’t be too hard to make a cupcake very similar. I was pressed for time, so started with a yellow butter cake mix, and added Heath Bar Crunch bits (the type without the chocolate), cashews, and some I added butterscotch chips. I only put the butterscotch chips in some of them, due to the fact that I have always had a hard time adding candies or chips to cake batter. They always sink to the bottom, even if I coat with flour. Well, sure enough, the chips sank to the bottom. I did put the chips in whole. I’m wondering if I chopped up the chips a little if they would not have sunk. The cupcakes have plenty going on without the chips anyway, as I added the cashews, crunch bits and caramel to the batter. 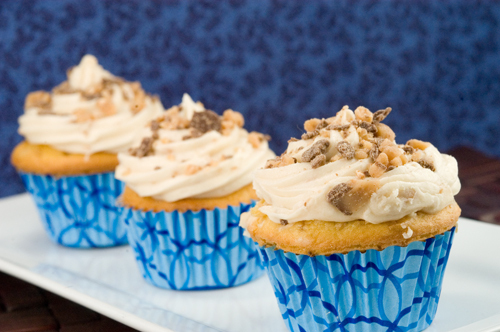 The buttercream frosting has caramel added to it, and topped with the Heath Bar bits with the chocolate added. In hindsight, I would probably use my regular frosting recipe instead of the buttercream, and add caramel to that. The buttercream is much too rich for the already sweet cupcake. Delicious caramel flavor and crunch in this delicious recipe. Preheat oven to 350 degrees F. Prepare cupcake pans with paper liners. Add crunch bits, cashews and caramel. Mix into batter. Distribute batter between 24 cupcake liners. 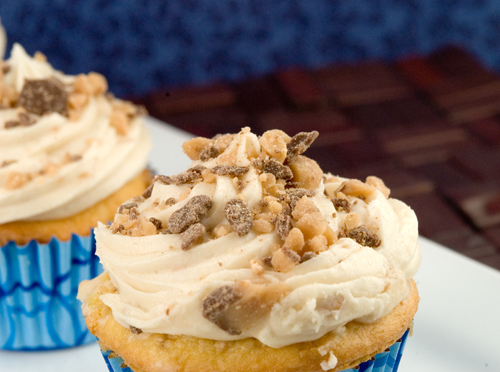 A delicious caramel frosting topped with Heath Bar bits. With electric mixer, cream together Sugar and shortening. Add caramel, milk or water and extract. Adjust consistency with confectioners sugar or water. 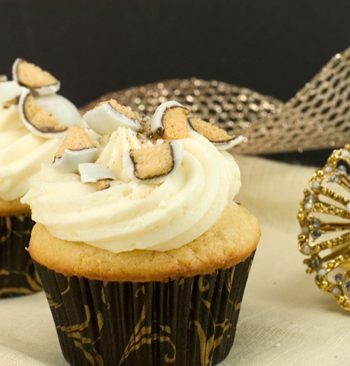 Mmmm these cupcakes look fab-I am so happy you decided to recreate these from that pin! I saw the pin and found out there was no link to a recipe. So I made one up that was similar. They only thing I would not repeat is adding the butterscotch chips. They sank to the bottom, even though I coated them with flour! I have never had any luck with adding chips or candies (like malted milk balls), to batter. They always sink. I would make a lighter frosting though, the cupcakes are pretty sweet.